Kizzycocoa – This one will be a short one. While playing FNaF2 to try and get images from the minigames (I got through all 5 nights unharmed, realising I had to die at the end of the time played), I stumbled upon some evidence that the old animatronics did indeed look like their FNaF1 counterparts. I’ve already stated that, due to the images in Kid’s Cove, the FNaF2 location was indeed open before FNaF2 starts. But that led me to a realisation, mostly through the plushies. Look at the mouth. Identical to FNaF1’s style of mouth. It is seen on the plushies, where the head is whole. 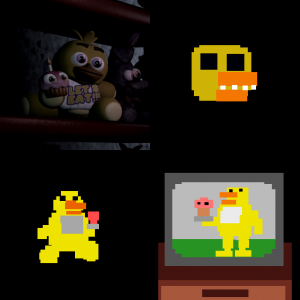 It is seen in the plushie the Crying Child has, which took place during Fredbear’s era (Fredbear’s closed 2 years before FNaF2’s events, and thus, Toy Chica’s creation), as well as the TV show, which was made in 1983. Naturally, this isn’t be-all end-all evidence. A lot can be brushed under the rug about this one. But the plushie itself, I’d expect to be segmented in some way similar to the animatronic. the formation of the mouth on the plushie seems too similar to just be a stylised choice. It was at this point that I realised, perhaps this theory is not correct. I do believe the animatronics did look like the FNaF1 animatronics at the rotting location, but this reasoning is grasping, and cannot be used as any kind of definitive answer. By the time I had finished the last sentence, I felt I was typing to convince viewers of something on shaky grounds. I do not wish to resort to such speculation, and that is why this observation has been skipped.